What eats me is we have MC First - none of us asked for this, how much development time has and is being spent on it? And all the while our fav editing tool that we earn a living off rusts and falls further behind. The answer for giving new editors a tool to "try out" was obvious - make MC free and lock down its export functionality. Like BM. No development time. What is needed is a complete rethink/recode of MC. Take what is great about MC and re-write it. Maybe the existing code can be modified to include all these things we have asked for for years - but I suspect at its core it cant. Make MC free for legacy work and, Avid, start again. Build the editor for the next 20 years... or watch as your user base drifts sadly away onto platforms that allow us to be more productive. I am confused. What do you not like about Avid's frame rate handling? I find it one of the best personally. What eats me is we have MC First - none of us asked for this, how much development time has and is being spent on it? For me MC | First is a bitter dissappointment and a complete waste of a great opportunity. The design priorities for First (MC and Pro Tools) seemed to have been to have a close to standard MC (and PT's) UI and functionality within a time frame 2 + years. The processing speeds of today's CPU and GPU's. (Getting rid of the original code limitations caused by both MC and Pro Tools each requiring all the computers services to be prioritized to whichever one was running. Huge fast hard-drives. (rather than more patching up code developed for single track video playback from stripped 9GB SCSI hard-drives and needing a separate audio drive.). A new Pro Tools audio engine developed for PT | First become the audio engine for MC | First. The Video Playback engine from MC | First become the video replay engine for Pro Tools First. This could have enabled common timeline and media file structures. Great options for co installs (with both open at the same time) not to mention sub frame audio editing and Audio bussing in the MC timeline. our fav editing tool that we earn a living off rusts and falls further behind. Actually, I don't have any sense of how many resources were devoted to MC | First vs the development of MC. They share a common code base and improvements in one often transfer to the other so it's not so black and white. I was under the impression that the idea with MC | First was to provide a means to attract a larger user community. I have no idea if that has worked for Avid but this seems like a reasonable way to increase market share. I think one of the reasons Resolve has taken off is because the free version is so capable (and let's face it, most people don't seem to want to pay for software if they can get something 'good enough' that is free). As an editing platform, I can't say that I'm overly fond of it (yet) but as an all-in-one solution it's pretty good (good enough to entice me to purchase the Studio version so the BMD strategy worked on me at least). I'm also not fond of the design-from-scratch approach. I understand that is what Apple did with Final Cut X and it took years before the product was up to speed for professional editors. We could expect the same with Avid, but I suspect Avid does not have anywhere near the resources that Apple has for such risky adventures. 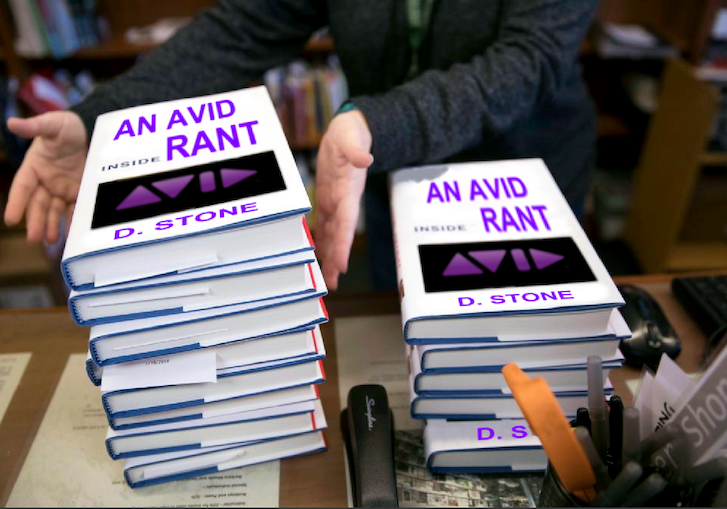 Ever since Avid moved to the annual subscription model I have seen significant and frequent improvements to the product at an unprecidented rate (for Avid) and my sense is that they have had to work through some architectural issues that are mostly behind-the-scenes. My hope is that they will address more user-facing features in 2018. Question: Was there another vote for feature priority? I had written a post earlier, which I removed shortly after (memo: never start a post when you're already gritting your teeth) as it turned into more of a rant. So I'm going to summarize what I did write in a more reasonable tone. As far as I'm concerned, a lot of issues arise from Avid's use of 3rd party products in oder to make a complete application. If you take away everything provided by other vendors, MC is woefully lacking in features. Without the 3rd party provided AMA plug-ins, MC can't ingest media from most modern cameras. Without Squeeze and QuickTime, MC can't export media usable by most other applications. It does have a competent color correction tool (Symphony), but that's a separately purchased add-on. It is completely lacking in the area of professional audio editing and doesn't even provide a lightweight version from another vendor. The native tracker, stabilizer, transitions, and filters are very limited, so you pretty much need something like Boris CC or Boris Red (Avid FX read: Boris Red no longer being provided by default). And let's not get started on the titling tool! A lot of this might be forgivable if MC was still the premiere NLE on the market, but that's no longer the case. The reliance of relatively high powered hardware and then still not being able to view media without stuttering compared to consumer app's which can view the same material in real time is, IMHO, unacceptable. Besides MC, I own Resolve Studio and LightWorks, and I've trialed pretty much everything else out there that runs on a PC. And to be honest, my favorite editor is still Liquid!! Compared to everything else I've tried, it's still the fastest editor I've ever used. The point I'm trying to get across is that the old studio system of having specialists each performing one step of the process, and around which MC is based, is great IF you're an old studio (or a large production house). But that market is rather limited. The bread and butter nowadays for editing is the small to medium shops and independents (like me). We're pretty much one-stop shops. We have to be able to ingest, edit, clean up color and sound, do basic VFX, create the titles, do the music, and produce the final media for the customer. Adobe has a complete edcosystem for that. While it's also dependent on multiple applications, the integration between the app's is far more complete, and the UI is pretty consistent. And Adobe owns all of the products (they didn't make customers wait for years before being able to ingest XAVC-S because the 3rd party creating the AMA plug-in decided not to produce it). This is the problem when so much of MC is based on other vendors products. And this is where Avid really needs to step up. While I agree with pretty much all of the previous posts, what I believe MC needs in 2018 more than anything is a complete re-think of the product and the current market. Everything from updating the software to run much more effectively on modern machines (much better use of threads, cores, and GPUs), to how the UI operates (let's face it, compared to some others it's become pretty clunky), to the feature set that should be built in. Oh, this one's nothing. My best to date was 13 pages, and only 6 sentences! And that was using a keyboard with a thermal printer and 300 baud modem at about 3:00 in the morning. The only problem I have with this is that I wouldn't use it (lol). For me, if I want a good quality h264 or h265 output then I will start with a QT Ref and use one of a number of external encoders at my disposal. This will always be my preferred approach. Of course, not everyone will agree. I'm just explaining why I wouldn't vote for a quick h264 out of MC as a priority. 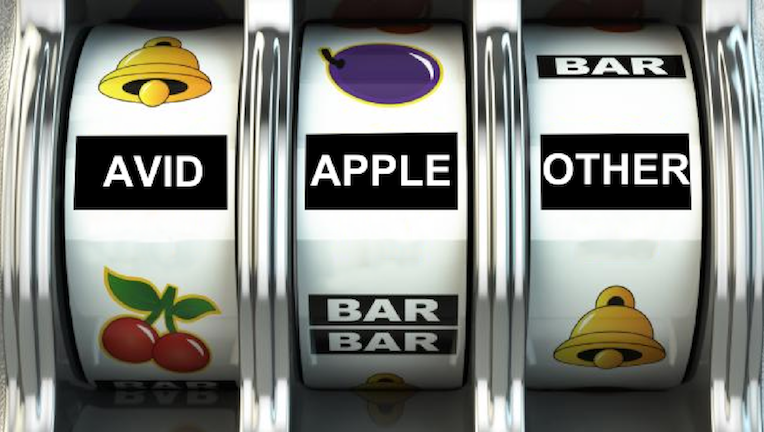 What I sense is that Avid isn't big enough to take on a complete rebuild, the current product will evolve as far as its core code will let it but ultimately, it will wither away as will its user base. I think the comments on its reliance on 3rd party apps demonstrates where it is in its life cycle. Perhaps BM should buy out the software arm of Avid and inject some new enthusiasm into development that will see Avid take some (not unsubstantial) risk in developing a new core. Andrew also summed up the wasted oportunity MC/PT First gave Avid - a chance with low risk to develop an all new platform embracing all that is good about MC and PT and starting again with the elements of the old code that hold it back from any meaningful development. Avid inovated NLE in its day, it needs to recapture that spirit of risk taking - no small ask. I do wonder how, as a community, we have consistently asked over the years for improvements to MC that simply have never come. Avid is listening but... it isn't explaining. This isn't the most important feature request but perhaps illustrates the frustration - why can't the software keep playing back while we rename clips in a bin? Is it simply impossible with the old code base? If so, tell us so we can stop asking and instead ask "when will Avid replace the old code base?" And the years tick on and no answers are given. We get "smart tool", interface colour changes that many have commented on actually make it harder to work - surely a simple thing to recode, even with an old code base, that could be fixed... but they are not. So what confidence should we have that bigger fish are going to be progressed? It has brought it into sharp focus for me this holiday season when performing my maintenance round on the edit hardware and backing up what we have done in 2017 and on what software. In 2007 Avid represented 100% of edits performed in the suite. By 2015 it was 80% but in the last 24 months it is barely 30-40% of edits, the rest going to Premiere or handled inside AE. PT has been dropped completely to move to Audition as has Avid FX/Red to AE. The current project planning sees 4 out of 5 new year projects starting on Adobe products and not Avid. And as I and many others have commented - the grass is not a lot greener in other camps - but they are integrated, enhance our workflow, inovate what we can do inside their software - even if they cause us to pull our hair out with bugs, updates and subscription. Overall the pain is now worth it where 2+ years ago it wasn't. I love I can restore old projects with little fuss where it can be problematic in Adobe at times as their versions change each year and often break old projects. I love that my brain muscle "knows" how to drive Avid without thinking. But as that % of Avid based work dwindles my bias dilutes and the arguments to stay inside the Avid ecosystem ebb away. Fingers crossed Avid, I hope you are listening but we are already slowly migrating so it doesn't matter if you aren't. Yea, lots to think about! Kinda of a gamble depending on the way you play it. 1. AVID-At what point will you get most of the thngs you need from the one app? Can/should you continue to compensate with other apps and work flows? Will one app from any copmany cover 100% of a users needs? With the "old" code is CUDA even a remote possibility? 2.APPLE-Will the mMP (modular Mac Pro) ever come out? Will the base model start @ $3999? Will there be any PCIe slots? Will an 8, 10 or 12 core model have enough power to over come AVID's "playback" issues? Will Apple pass on the mMP because they would rather put 3 cameras on the next iPhone? 3-Other-Too invested on the Mac side to consider PC. FCP is not an option. Then there is Premiere. Is this the year for AVID to get it's act together? Is it possible to turn things around all within MC9?! If AVID can get it's playback engine tuned, that would turn heads. I don't mean the old AVID way. I'm talking put a video on YouTube and everywhere else. In this video the unheard of is shown. A 9 shot RED 6K multicam timeline is shown, the space bar is hit, the footage plays. A window is clicked, the footage does not stop playing! 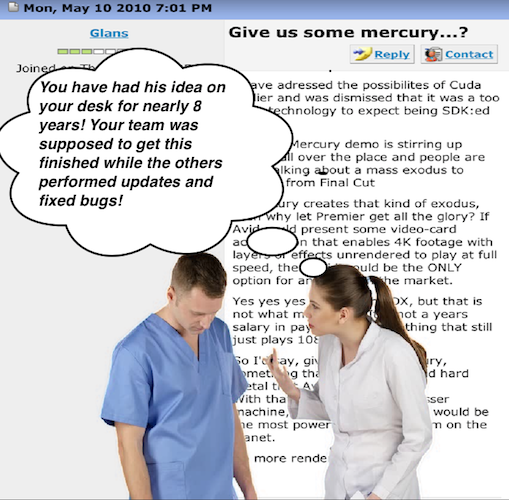 As it continues to play the specs of the old computer are shown on the screen.The video fades with "Happy Days Are Here Again!" (memo: never start a post when you're already gritting your teeth) as it turned into more of a rant. There just so happens to be another "best" seller about to hit the bookstores! But AVID can head this one off at the pass. I got a hold of a copy and had to carry it in a brown paper bag. It would be in AVID's best interest to make MC9 with the biggest WOW factor ever!